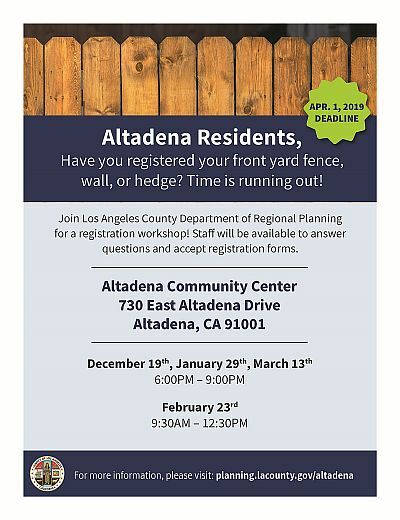 The postcard below regarding the Altadena CSD Fence, Wall, and Hedge Registration was mailed out to property owners in Altadena. Registration is open through April 1, 2019. 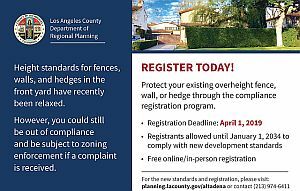 The Altadena Community Standards District (CSD) is a supplemental district of zoning regulations to ensure that new and expanded structures and uses are compatible in size and scale with the surrounding neighborhoods within the unincorporated community of Altadena. The existing CSD was established in 1998, and is based on the 1986 Altadena Community Plan. The current update to the Altadena CSD is in progress in collaboration with the Altadena CSD Committee, a subcommittee of the Altadena Town Council. The final ordinance has been adopted by the Board of Supervisors. The Altadena Community Standards District is a part of Title 22, the County of Los Angeles Zoning Code, tailored to meet the needs of the Altadena community. The Altadena CSD Update in Section 2 of the Ordinance revises uses and development standards for residential and commercial areas to maintain the diverse, eclectic and unique character of Altadena, and encourage town/district centers with thriving businesses and pedestrian oriented development. The intent of the update is to provide more opportunities for home based occupations, address heights of fences and walls in front yards while providing flexibility to property owners for compliance with revised standards, provide more consistency for front yard setbacks, create a pedestrian friendly building design and community consistency for commercial uses and signage, and make businesses on undersized lots more viable while protecting and enhancing the residential nature of the surrounding community. The CSD modification process is streamlined to be consistent with how discretionary projects are processed through the Minor Conditional Use Permit. Sections 3 through 10 of the Ordinance are not specific to Altadena. These are countywide ordinance amendments that will provide consistency for discretionary projects for Hearing Officer cases and for the Minor Conditional Use Permit.